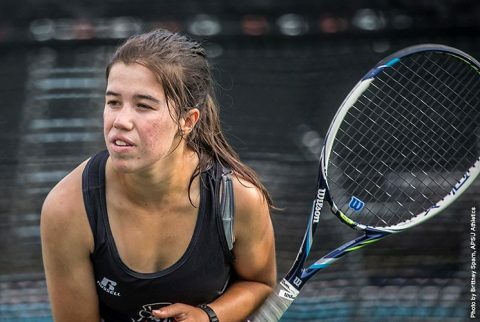 Murfreesboro, TN – Lidia Yanes Garcia and Claudia Yanes Garcia each qualified for the main draw of the 2016 Ohio Valley Regional Championship over the weekend hosted by Middle Tennessee State. Claudia Yanes Garcia, who earned the No. 2 seed in the qualifying draw for the main singles bracket, won her opening match over Viktorija Demcenkova from Eastern Kentucky, 6-0, 6-3, before topping Luisa Zirilli from Middle Tennessee, 6-1, 6-1, to advance to the main draw. She continued the momentum in the main draw with an opening round win up an upset of the No. 4 seed Justina Mikulskyte from Kentucky, 1-6, 7-6 (6), 6-3. Yanes Garcia’s run ended when she fell to Anzhelika Shapovalova from Miami of Ohio 7-5, 6-4. Lidia Yanes Garcia earned an outright spot in the main draw and opened play with a 6-4, 6-4 win over Yi Chi Ma of East Tennessee State. Her main draw run ended after a 2-6, 6-3, 6-4 loss to No. 9 seed Emma Kurtz from Vanderbilt. In the B Flight singles draw, Helena Kuppig won her opening match, 7-5, 6-4, over Suzanna Stapler from Belmont before bowing out to the No. 5 seed Gaby Paul, 6-3, 7-5, from Memphis. Ana Alberston lost her opening round match, 7-6(5), 5-7, 6-3, to No. 5 seed McKenzie Barco from Chattanooga. The Garcia sisters fought their way through the qualifying doubles bracket with a pair of wins to advance to the main draw event. In their opening match they defeated Cloern and Brdicka from Wright State, 8-0, before sealing their place in the main draw with an 8-1 win over Viccars and Ma from East Tennessee State. In the main draw, the duo won their first match, 8-4, over Argente/Demcenkova from Eastern Kentucky. They followed up with an 8-2 over Edwards/Patton from Chattanooga. Their run ended at the hands of the No. 2 seed Sharma/Kurtz from Vanderbilt, 8-5. The event ended the fall slate for the Govs.